NSK's PU Series and PE Series linear guides have been designed for clean, miniature applications with smooth linear motion. Recently announced is a high-load capacity line in sizes 09, 12, and 15. The lightweight compact design of this linear guideway features resin ball recirculation components that offer reduced noise output. The components also offer less dust generation and high corrosion resistance. Ideal for medical and semiconductor industries and most factory automation applications. Nsk Linear Guide PE12ARS applied in following application like Microscope Machine , Medical Equipments, Miniature gauge . Nsk Linear Guide PE12ARS Linear guides have been designed for clean, miniature applications with smooth linear motion. Recently announced Nsk Linear Guide PE12ARS is a high-load capacity line in sizes 09, 12, and 15. The Nsk Linear Guide PE12ARS lightweight compact design of this linear guideway features resin ball recirculation components that offer reduced noise output. Nsk Linear Guide PE12ARS components also offer less dust generation and high corrosion resistance. Nsk Linear Guide PU12TRS applied in following application like Microscope Machine , Medical Equipments, Miniature gauge . 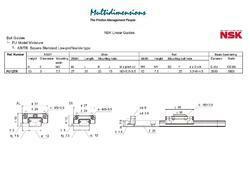 Nsk Linear Guide PU12TRS Linear guides have been designed for clean, miniature applications with smooth linear motion. Recently announced Nsk Linear Guide PU12TRS is a high-load capacity line in sizes 09, 12, and 15. The Nsk Linear Guide PU12TRS lightweight compact design of this linear guideway features resin ball recirculation components that offer reduced noise output. Nsk Linear Guide PU12TRS components also offer less dust generation and high corrosion resistance. 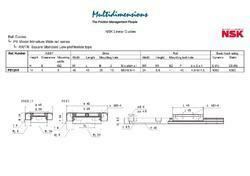 Looking for NSK PU-PE Series of Linear Guide ?